This website was built for two purposes. One, it was designed to give a truly unique look and feel. Two, it was designed and built to provide consumers with good information, an easy way to find the information and to rank high in the search engines for lead generation. 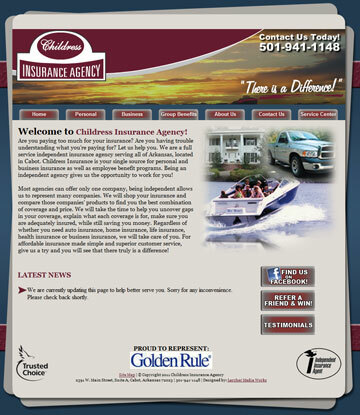 This site features a custom design, flash header, home page video and drop down navigation. The custom flash header has even been used in a billboard design. In addition to the main website, we designed and built a mobile website to allow mobile searchers to easily be able to navigate the website. "We have used Lercher Media Works services for years. They have done an excellent job on everything that they have ever done for us. They created and continue to update our website. We get lots of compliments on the site and a lot of business from it. Greg does all of our advertising layouts as well as our letterhead, business cards, envelopes, etc. He has a very quick turnaround time and can put together something for you the same day if you find yourself needing it at the last minute. He is full of ideas and has always been able to do anything that I have requested of him. Greg is a great guy and does excellent work. I would highly recommend him to anyone!"